Following his #1 New York Times bestseller, Our Endangered Values, the former president and winner of the Nobel Peace Prize, offers an assessment of what must be done to bring permanent peace to Israel with dignity and justice to Palestine. President Carter, who was able to negotiate peace between Israel and Egypt, has remained deeply involved in Middle East affairs since leaving the White House. Now he shares his intimate knowledge of the history of the Middle East and his personal experiences with the major players from all sides in the conflict, and addresses sensitive political issues many American officials avoid. Pulling no punches, Carter prescribes steps that must be taken for the two states to share the Holy Land without a system of apartheid or the constant fear of terrorism. The general parameters of a long-term, two-state agreement are well known, the president says. There will be no substantive and permanent peace for any people in this troubled region as long as Israel is violating key U.N. resolutions, official American policy and the international 'road map' for peace by occupying Arab lands and oppressing the Palestinians. Palestine: Peace Not Apartheid is a challenging, provocative and courageous work. 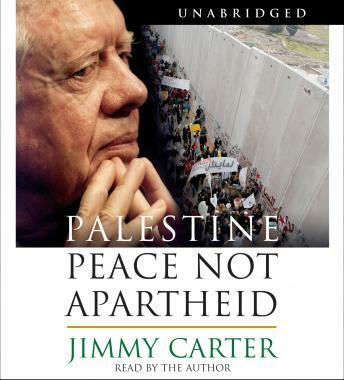 Jimmy Carter merely lists the civil rights violations by Israel. Carter's critics retaliate with Palistian suicide bomber atrocities, fighting for the moral high ground. As Robert Scheer recently said "Foreign occupation is the mother's milk of terrorism" Carter, in this book,merely points out to Israel this downward cycle of death and destruction can be stopped. Israel holds the key.